Summertime is Funtime. The brand new issue comes in beautiful color and joyous mood. Artists, who really wow us are featured, like Renata Kraus who draw magical floral pictures which look like realistic watercolour art, only made of wool fibers. Her unique bags are in great demand all over the world. Jenne Giles loves to create dresses and accessoires for her label »harlequinfelt« with just as astounding colors, letting anybody pay attention on it immediately. Playfully multilayered scarfs are one of her best work which compete with any neck jewellery. 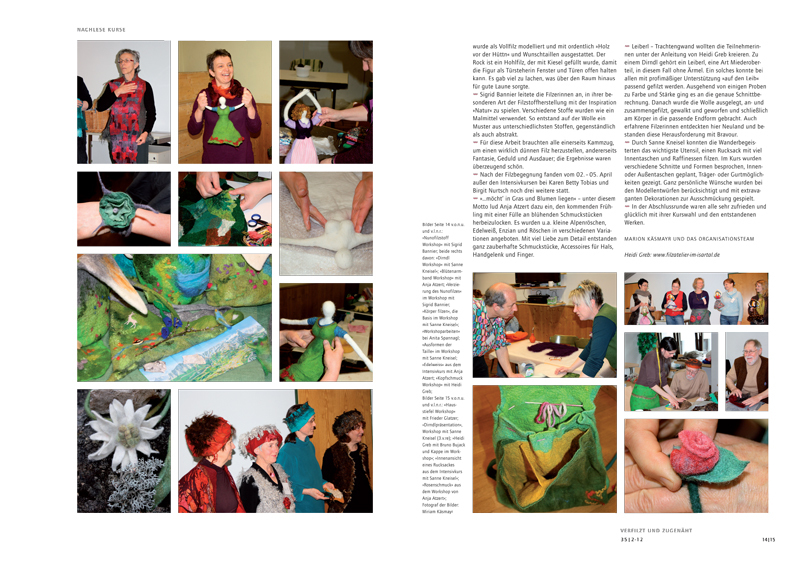 For Kerstin Scherr the time of felt making began with a felted mouse. Now she has her own special fashion label. With self dyed wool and silk, she creates patchwork-like dresses. In addition to these great portraits with pictures and background stories to the artists, you’ll see the melancholic and dreamy photos on transparent materials by Amelie Anke Merzbach and you´ll get the story behind the young start-up company »Partyzan Hats«, which sell traditional Ukrainian Hats. Lene Nielsen (Finland) wrote an excluisve tutorial for the »verFilzt Und zugeNäht« to show how you get an minitaure template for precise shaped felt. For impulsion we placed photos of great work directly after the tutorial, so you can see which great things are possible with this technique. The connection between wool and gold is one of the main interests of Karen Betty Tobias. She has explored the blessed material and was surprised, which phantastic results are possible. With all of her experience about gold and felt she instructed an intensive workshop at the 17. 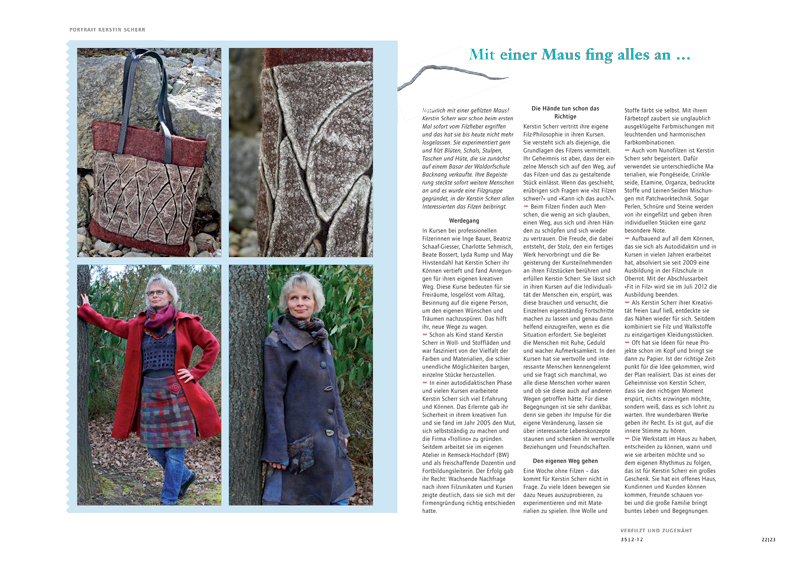 German Felter´s Meeting, from which you also get reports in this issue. Like the theme of the meeting, the FUN looks with her readers »With a Stovepipe Into the Mountains«. You can read about the highlights of the meeting, the exhibiton at the »Dorfgalerie Grainau«, a traditional Bavarian Evening, a journey to the picture-perfect Eibsee and the intensive workshops like the one by Birgit Nurtsch, where the members felted a »Kraftgürtel« (Power Belt) which is supposed to warm up the female center. A good balance to the daily school routine is the Filz-AG by Stephanie Selke-Ackermann. There she creates beautiful flowers, mouses and monsters, even with leftover odds and ends of wool with her students. With the work at the Filz-AG she has to keep the balance between determining factors, wishes and claims of herself. 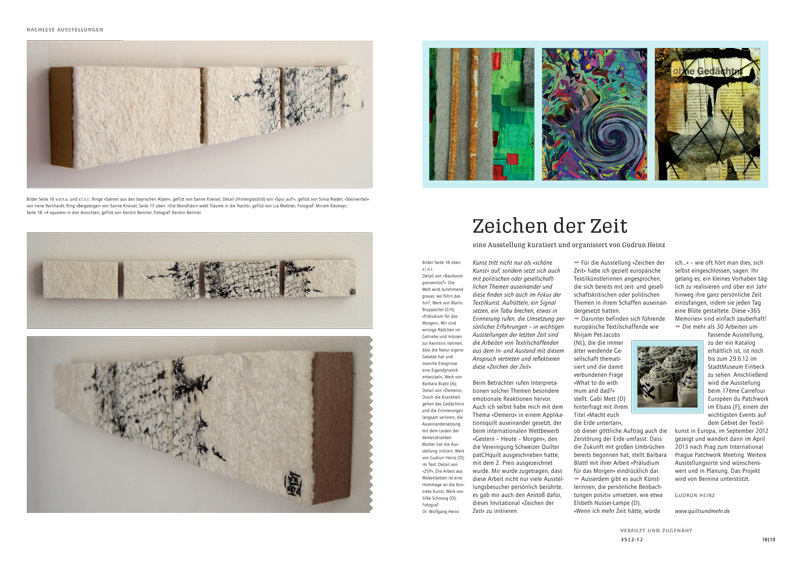 Lea Rombold is very motivated to take the vocational training in textil design with the specialization on felt. She would like to pursue her ideas with your help and is therefor waiting for offers of cooperation by interested studios.Embroidery and Felt making harmonize already at the working process. Who ever tried it to combine knows which pleasure with embroidering felt. This way any felted work gets an unique character. Anne Lange offers online courses where she gives the members all of her know-how about this topic. Original Finnwool is hard to get. 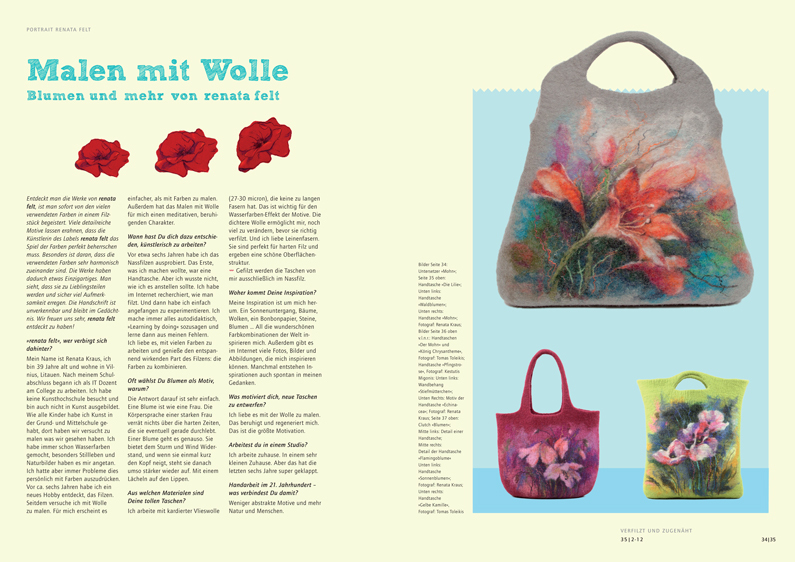 Frauke Walder has found a tiny manufactur, where she now purchases Finnwool for stable and heavy duty felts wich are great for carpets, cushions, wall hangings or bags. In the category sustainability we report about the fashion label »anmage«. Behind the label young Palestinian women design beautiful dresses with enchanting embroideries. On the FUN felting journey we go all the way to Africa with you, where a project gives woman a job, hope and money for her families. In professional mood they create felted cushions which can be ordered worldwide, actually with your own design wishes. 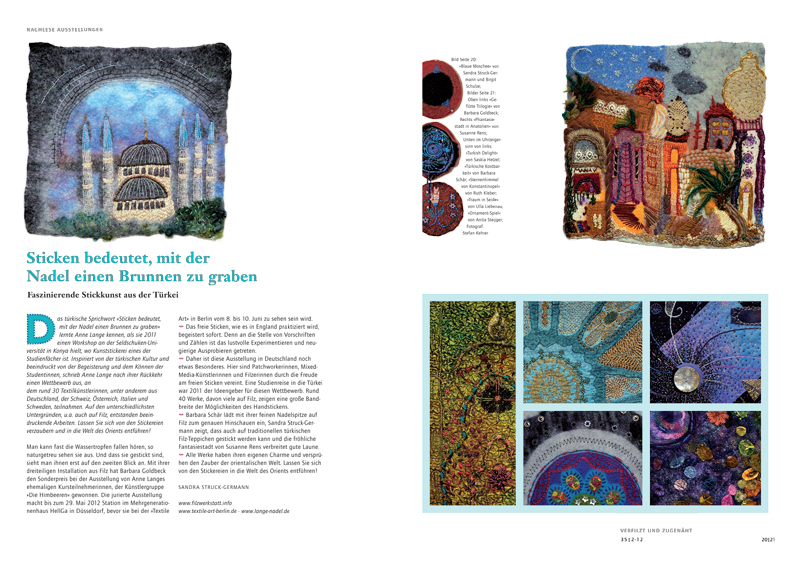 Reports about more exhibitons and workshops, book reviews and the preview for events in Europe complete the Summer issue of 2012. 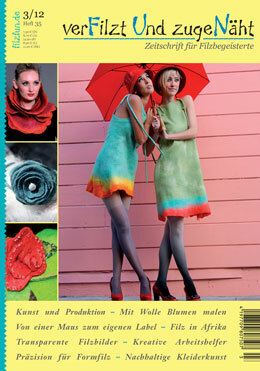 With this issue you also get first hand information about the new international textil contest »…in Bewegung« (»… in motion«).